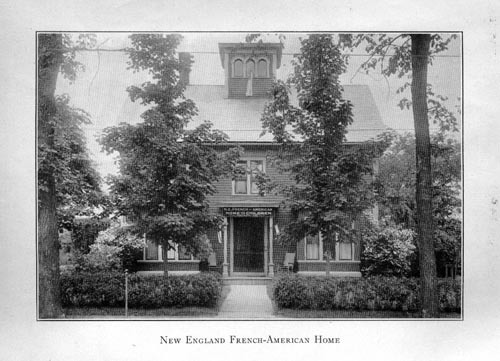 The New England French American Children's Home was organized on Greendale Avenue, Worcester, Mass., in 1896. 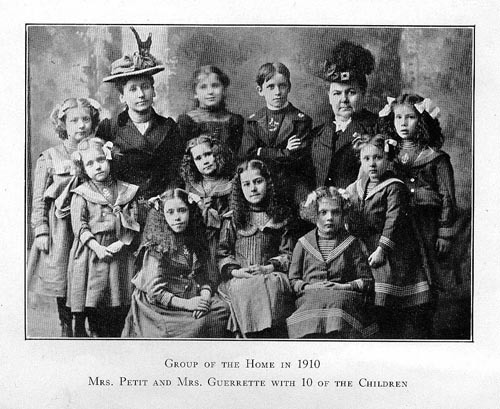 Three years later, March 29th, 1899, it was incorporated under the laws of Massachusetts for the purpose of undertaking the care and education of destitute children. Even the most sanguine of its founders could scarcely have anticipated the possibilities for good which lay dormant in the birth of this Institution. Little did we realize when we rocked to sleep the first little one that entered our Home, that this child was to be the forerunner of what now promises to be hundreds and perhaps thousands of children in coming years. Blessed indeed is any Institute, whose providence it is to meet the needs of distressed humanity. To be of true service to as many destitute children as possible is the true object of this Home. We now enter into the twenty-fifth year of existence as an Institution. Many changes have taken place since it was founded. The most important, being the change of locality. Although the work-started in Worcester, we are now located at 163 South Street, Fitchburg, Massachusetts. The Orphanage moved many times because of lack of funds to establish a permanent Home, but the struggle for its existence was never given up, and the present site with its commodious building of nineteen rooms and a large Hall, with spacious grounds, is the reward of many years of faithful service on the part of those most interested in the work. The main Building is in excellent condition and once was the mansion of one of the oldest families of Fitchburg. The sum paid for this house was a mere shadow of its worth. The low price asked for the estate and its adaptation to our work, in its mode of construction, and its beautiful locality, was mostly responsible for the removing of our Home from the one city to the other. We also believe that the health of the children was greatly benefited by the change. The breezes that sweep over the hillside where our Building stands, ever supply our children with invigorating air, both in the house and on the playground where they exercise. Their ruddy cheeks and romping disposition testify to their good health. Both English and French is spoken in our Home. As many of our French children have come from all parts of the New England States, we have had many of them that did not speak any language other than the French. However, by attending the public school the English Language is soon mastered and the knowledge of two languages only adds more opportunities for those children in earning their living later on. Most of our children are sent to the public school near our Home; the smaller ones are taught, at home. At the age of fourteen when the children have finished their school course, the boys are given an opportunity to learn some trade or business. The girls are taught housework. Those children who show a tendency to get a higher education, have been given the opportunity of learning a profession at Feller Institute, Grande Eigne, P. Q. Our Home is not supported by state, city, or town funds, but by legacies and contributions from churches, societies and individuals. We also derive quite a benefit from membership fees of one dollar a year. We hope to increase our list of members by one thousand more at least, in the near future. 1. "Annual Report," Twenty-fifth Annual Report with a short Historical Sketch of the Institution from its foundation to the present day, 1920, page 6-8.